Fly in to historic Columbia! This is a pilot's dream getaway. 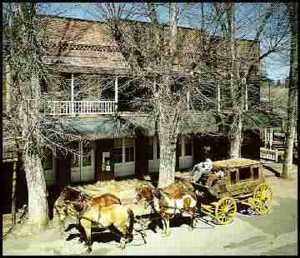 The old town of Columbia is located in the Gold Country of the beautiful Sierra Nevada foothills. 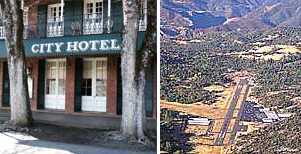 You can fly in and walk from the airport or drive to beautifully restored Gold Rush hotels and inns that are furnished with antiques and are within walking distance to a three-star restaurant, saloon and ice cream parlor. Columbia has been called "the ghost town that never died." Located in the heart of the Mother Lode near Sonora, Columbia, Territory of California, offered up $87 million in gold in 1860s dollars -- that's a half billion at today's values. Once one of the largest cities in the state, the town came and went in a mere ten years. Today, the town affords a living history of the Gold Rush era, with a restored business district and a very nice general aviation airport. Some of the many great accommodations available around Columbia include the old City Hotel and its sister the Fallon Hotel. Also Columbia Cottages at Columbia State Park offer several overnight choices.